Microsoft on Thursday announced the pricing for its forthcoming Surface Pro tablet, starting at $899 for the entry-level 64-gigabyte version with an Intel processor and the full Windows 8 operating system. Customers will be able to double their storage to 128 gigabytes for $100 more with the $999 Surface Pro model, the Windows maker announced via its company blog. 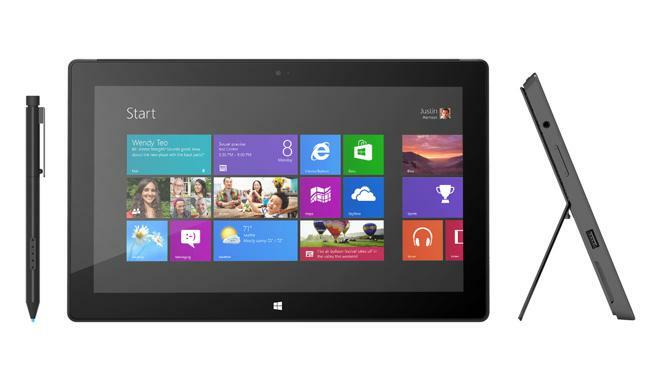 Both models of Surface with Windows 8 Pro will be available in January 2013. All Surface Pro models will come with a Surface Pen, Microsoft's proprietary stylus, with Palm Block technology. The hardware also features 4 gigabytes of RAM, a USB 3.0 port, and the full Windows 8 operating system. Like the ARM-based Surface RT, Surface Pro features a Dark Titanium VaporMg casing, dual 2x2 MIMO antennas, and a built-in kickstand. The professional-level machine will also weigh less than two pounds and be less than 14 millimeters thick. The Intel-based Surface Pro will also feature a Core i5 processor with integrated graphics to power a 10.6-inch display running at 1,920-by-1,080 pixels in a 16:9 aspect ratio. It also has a Mini DisplayPort that can power an external display up to 2,560-by-1,440 pixels. The Surface Pro is Microsofts attempt at creating a hybrid between a full-fledged PC and its currently available Surface RT operating system, which runs on low-powered ARM processors. Given the price points and features of the Surface Pro, Microsoft's high-end tablet hardware may be targeted as more of a MacBook Air competitor than something positioned to take on Apple's iPad. In comparison, Apples entry-level 11.6-inch MacBook Air, with some similar specs, costs the same as Microsofts higher-end Surface Pro  though consumers of the latter will have to pay at least $120 more for one of the compatible Surface keyboard covers, which are not included with Microsoft's tablet. Microsoft's announcement arrived Thursday on the heels of a rumor from hit-or-miss publication DigiTimes, which claimed that Microsoft is drastically scaling back orders for its RT tablets after a soft start. "Microsoft originally expected to ship four million Surface RT devices by the end of 2012, but has recently reduced the orders by half to only two million units," the report said.